I noticed during the WES the various ways folks use AR and SK. I was taught in ’61 to use AR before the call signs and SK in place of K at the end. I noticed both pro-signs in both positions over the weekend. I can’t find my old ‘how to operate’ guides so I haven’t directly checked what was recommended. Any FOC types out there or folks who can find their guides of just the preponderance of opinion on how to do this. I am mentoring a new to code ham and want to give him the best operating style I can manage. The way I remember it, AR was used when answering a CQ; [call sign] DE [call sign] AR and at the end of text (turn) in a QSO, AAAA AAAA AAA AR [Call sign] DE [call sign] K, or KN. great point! I don't know -- I just do what I have learned. I am sure the proper practice is documented in sometime written decades ago. maybe you can research your stuff, etc. and provide the info. work with SKCC leadership and maybe proper CW etiquette can be provided on the SKCC website. maybe I once heard AR there call de my call SK -- but I do not trust my education here. ?? There was a discussion about the AR prosign use a while back on one of the forums, perhaps in eHam. When I was first licensed back in 1978, the only time AR was when answering a CQ. It was sent between my call and K.
So it would be AAA de WB4M AR K.
I was taught this by some long-time hams back then at our radio club. It was not used at the end of each person's turn, only when answering a CQ. Apparently, AR was used differently by some and one ham took me to task about it in the forum! That was an excellent link, to the IARU document "Ethics and Operating Procedures for the Radio Amateur". Thanks. I think this has go be regarded as the definitive document on procedures and prosigns for the radio amateur. Check in particular sections II.9.2 and II.9.3 pages 22-24 of this 68-page document. I learned my procedures and prosigns some 50 years ago, as a SWL leading up to obtaining my first ticket. What I learned then may have changed in the last half-century, or perhaps have been partially incorrect. My memory is not to be trusted either. In future I'll be keeping a printout of the above document near my operating desk. 73 Darrel, aa7fv & g3sys. I was trained as a radio operator in the Army in 1962. I don't recall even using AR or KN, although they may have existed in a manual somewhere. We concluded messages with "over" (K) or "out" (SK). We also used "standby" (AS) some. The big no-no was saying "over and out" which, we were told, was like telling the other operator to talk and to shut up at the same time. It looks to me like the addition of all these pro-signs is just causing confusion. It appears the procedures are heavily influenced by military methods and perhaps the experience of the authors in contesting. Perhaps this makes some sense in that the authors are European. It's also interesting that the document runs contrary to what has been considered proper procedures for decades. It would be interesting to know the history of the document, the authority under which it was developed, and how the authors developed their conclusions. If one reads the preface, it seems to imply that the document was not promulgated by an IARU committee but was instead developed by two or three individuals and simply published under the IARU masthead. Personally, I wouldn't put too much stock in it, but then, my opinion is perhaps worth only what you paid for it! LOL. It would be fair to say that this document has been challenged on several occasions but never (to my knowledge) updated to reflect feedback. Both FISTS Europe and EuCW, representing national and transnational societies in Europe, raised concerns but with no practical response. In fact EuCW supported Villi, TF3DX and the Icelandic group in an attempt to have IARU take heed of all this back in 2014. This document was received with quite a large amount of disagreement from around the world. I would dare say, it was not widely accepted. You are absolutely correct, JW, in that much of land line telegraphy influence radio procedures. This was before radio was used by the military. The military adopted radio's procedures and then modified it to meet their needs. Conflicts and/or confusions grew out of operators going from one service to the other or active in both arenas. Having been active in the NTS, MARS and military service, I sometimes caught myself using the wrong accent in one or the other, especially when I was active in all three at the same time. Like you, JW. I grew up on the QMN with Tate, W8FX, as one of my Elmer's. I even followed Tate as the next Michigan SCM (SM). Michigan has been blessed with some great CW and traffic operators and I was lucky to know and learn from many. Well, I hope I learned from them. Hi Hi. The process of creating standards is an interesting subject by itself. Whether its industrial standards, standards for athletics or the like; a variety of factors have to be addressed, including historical knowledge of how standards evolved and why. Additionally, input is essential from a representative group of stakeholders and a process must be in place to manage competing agendas and perspectives. It's not enough to simply pick a few seemingly knowledgeable people and tell them to draft a document based on their own operating interests and agendas, which, unfortunately, seems to be the way things work all too often in ham radio. There's a couple of interesting clues within the document that point to a lack of historical knowledge. One of which is the reference to "VA" as being "incorrect," as well as a failure to address the origins of "AR." It's application in the document falls uncomfortably between the military usage and the original purpose indicating "end of message." I would have felt better if they had picked one method or the other. I can certainly see why the document was not well received. Standards written without diverse stakeholder input and without being reflective of their historical evolution usually are not well received. However, I suppose "done is better than perfect," and lacking a better document in wide circulation, there is probably no harm in using the procedures as outlined. By the way; I remember "Tate." He was certainly "Mr. QMN." For many years, Tate's spark transmitters were on display at the Henry Ford Museum until the counter-culture generation curators decided that telecommunications history was far less interesting than "rock and roll history" and removed them from display in favor of "Motown Rock and Roll" exhibits and the like. LOL. I was manager of QMN for quite a few years myself and enjoyed the group immensely. I still check-in to QMN regularly. It's a great CW net and an ideal place to learn "real" CW skills. The purpose of this document was for it to become a universal guide on operating ethics and procedures. as representing their view on the subject. During subsequent Regional IARU meetings it was emphasized that the document be made available to the Amateur Radio Community via all available means, at no cost, and in as many languages as possible. I have not seen this before now. I’ll spend a bit of time (recovery time for my “WES fist”) reading and learning. Unfortunately, there is always an “EXPERT” who wants to tell you how you must do things. It seems the older I get the nearer to that old pain in the posterior I come. Still, I do not like to pass along erroneous information. I received two good links on topic. Both seem well worth the time to look at and maybe adopt. I thought that "ar" meant end-of-message. I've always viewed it as sort of a generic thing, meaning something like "I'm done now". K, KN, SK or VA are sent once a contact is established. AR is also used in formal messages. I have not seen it changed since 1957 except by misunderstanding. 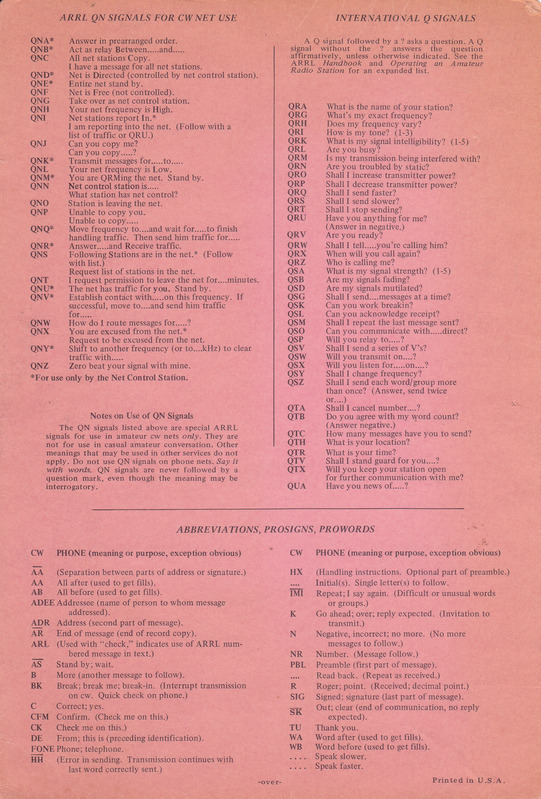 Here is the back of a card from the ARRL labeled OP AID 9B called "Amateur Message Form" that I used when handling CW Traffic on the Michigan QMN CW Net. BTW the "ARRL QN Signals for CW Net use" were first established by W8DYH of the Michigan CW Traffic Net (QMN). As verified in a letter to me dated April 24, 1978 from George Hart, W1NJM (SK) and this by Dan, KB6NU. The best way to find out how the few SKCC members use Pro-Signs is here on the forum. Very few operators use Pro-Signs except MARS and SKCC, so most of us just append a K when we are ready to quit transmitting. Most DX stations expect a 5nn tu for a reply, but will accept anything you want to send if it is short. The new to code ham knows nothing, so will do what ever you tell him. Pro Signs are valued by SKCC, but most of us just ignore them and may or may not know what they mean, but will accept anything. It is just the perfectionist in me that wants to do things “right”. That and I just do not want to teach something that is incorrect. I just checked my log; my first SKCC QSO was Dec 28th, 2008! Last SSB QSO (except one local antenna test for a friend) was Sept 2007. You are my only 6 meter QSO. I’ve got to spend more time trying 50 Mhz. Good to have you back, my friend. We were taught, pro-signs go BEFORE the call signs. "ALL HR GUD OM BTU /AR W8XYZ DE KA8VIT K"
"BN NICE CHATTING WITH YOU = 73 /SK W8XYZA DE KA8VIT"
K is not a pro-sign per se. AR is the equivalent of voice use of OVER, use at the end of a transmission. I use AR in three instances. At entry to a traffic net "de k4oso ge qru AR". At the end of an NTS radiogram "milt AR N"
And usually at the end of qso before signing "tnx OM fer fb chat 73 es bcnu AR k5nt de k4oso k". I don't recall ever using it any other way in qso's with fellow FOC members. Most of our chats are conversational...you pause and the other guy starts talking...or one of you breaks in on the other. The ARRL Operating Manual shows SK used before the callsigns. Their explanation of the AR prosign is a little less clear but another ARRL reference I have around here somewhere shows AR used before the callsigns also. AR is pretty handy to use in place of K when initially calling or responding to a station before both parties know for sure that they can hear each other. This is often the case nowadays when a lot of contacts are originated online, sked page, etc. This usage is described in the old ARRL operating guides, i.e, use AR in place of K before communication has been established. Except for a general CQ: in that case use K, not AR, to end the CQ. Never use "AR K" in combination. Interesting that hams have created their own meanings and uses over the years. If you are looking for the correct usage download a free copy of the Allied Communications Publication 124 (ACP-124). It is interesting to see in that 68 page link you previously received the following applies and agrees with ACP-124. In there you will see <AR> and K are never used together. <AR> means end of transmission and a response is not required or expected. K is an invitation to transmit. Another fun way to confuse people is to assume that all OPERATING SIGNALS can be turned into questions. Check out the Q signals in ACP-131. In there you will see signals that when turned into questions back fire. Some of the confusion with what is and what isn't a prosigns and there meanings is evident is some of the answers you have received. Clarification can be found in the free download Allied Communications Publication 125 (ACP-125), Annex A to Chapter 3. Or ACP-124. <AR> K and the QN signals confusion comes from hams writing articles and/or books without looking for the actual reference manuals from which the original information came from. 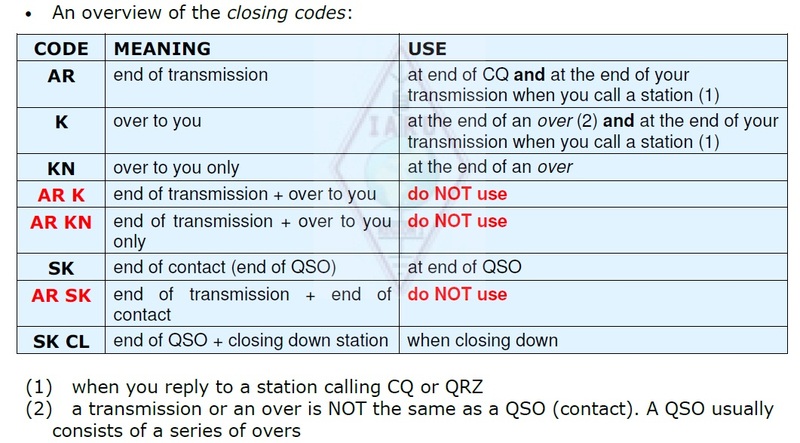 Some people writing ARRL communications books mention that OUT means you are leaving the air and shutting down. For many many years leaving the air the prosign used to be <CL> and the proword CLEAR. Sending <SK> should always be sent at the end of the transmission. Again someone wrote it should be put before call signs in a magazine or book and people adopted it as gospel. Old timers told me the way to remember where to put <SK> is you put it in place of the K or <AR> as there is no need to use both. QN signal will only get confusing on a net where you have NON-ARRL-TRAFFIC handlers. ACP-131 shows different meanings for some of these signals which won't make any sense on a traffic net. Check out QNI in ACP-131 and compare it to QNI on the NTS site. The reason for this confusion is that the ARRL did not register the QN signals with the Allied Electronics Board, which publishes the ACPs. Some hams have will argue that none of this came from allied communications when in fact most of our procedures comes from when the U.S.Navy performed the duties that are now the responsibility of the FCC and realized standardized communication with our allies was essential. The proper use of "AR" is a question that seems to have a life of its own. There is also a lot of mythology circulated about the proper use of this prosign. "AR" originates with commercial telegraphy. It is actually "FN" meaning "Finished" in American Morse Code; "DI-DAH-DIT" being "F" and "DAH-DIT" being "N."
The "FN" indicates the end of the telegram and it separates the message from the circuit overhead and administrative exchanges. It might be viewed as a dividing point. The American Morse comma is still used in the form of the prosign (AA) after each line in the address. The "BT" is the prosign for "break, and it separates the preamble (and address) from the text, as well as the text and the signature. The "AR" indicates the end of the radiogram and it might be followed by "N" for "no more" or "B" for more messages to follow (e.g. "AR N" or "AR B). OK, so you're not sending telegrams or radiograms. That may be true, but technically, the content of your message to the other operator IS YOUR RADIOGRAM. It might be a signal report, name and QTH or talk of the weather, but it's still a "message." Therefore, the "AR" goes after the message content. That is; it separates the essential content of your transmission from the network overhead, which is the FCC required identification. ".....RST 599 NAME JIM QTH MARION IL HW CPY? (AR) K8QMN DE WB8SIW K"
The prosign "SK" also originates with commercial telegraphy. In American Morse Code, it is "30," "DI-DI-DI-DAH-DIT" being the figure three and "DAAAHHH" being the figure zero (there are three different dash lengths in the American Morse Code). Of course, in International Morse (Continental Code), the 30 becomes "SK." "30"comes from the wire codes meaning "close of work." For example, press telegraph operators transmitted "30" at the end of a story transmitted to a newspaper. It essentially means "I'm done." This likewise belongs at the end of a message, only here it indicates that one is done with the QSO. "....TNX FOR THE GREAT QSO BILL 73 (SK) K8QMN DE WB8SIW K"
Once one understands the historical purpose of the prosigns, it makes more sense. It should be noted that in military practice, the prosigns are (were) used somewhat differently. However, for amateur purposes, the "AR" and "SK" belong after the message content, but before the call sign exchange. One other note involves the "CQ:"
There is really no need to send "AR" after a CQ. One is not really exchanging any messages, but rather, one is attempting to establish contact. A "CQ" is simply overhead on a circuit. A simple 3 by 3 CQ followed by the prosign "K" is more than sufficient. I hope that helps clarify this issue.